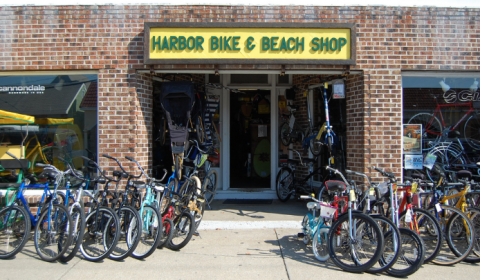 Family-owned and operated for over 30 years, Harbor Bike & Beach Shop is the place for all your biking needs. Whether you want to get on a new bike, fix your old one, or cruise around beautiful Stone Harbor on one of our many rentals, we have something for everyone. Also in stock is a wide selection of skimboards, skateboards, metal detectors, and beach supplies. Brand offerings include Giant, Cannondale, Electra, Jamis, Kettler Tricycles, Zap Skimboards, Canari and Cannondale clothing, and many more. Closed Tuesday, Wednesday, and Thursday.